Ekene is an Atlas Corps fellow serving as an Operations & Internal Communications Fellow with the goal of supporting the streamlining and operational improvements of PYXERA Global’s internal and global communications for improved collaboration and service delivery across all departments and global offices. As an Information Technology Specialist with a focus on enterprise content management and education technology, she has worked with enterprises, nonprofits, and the government in Nigeria to transform and optimize their organizational processes using technology. Previously, she worked with Infographics Nigeria where she had the opportunity to impact the lives of over 10,000 teachers with no prior knowledge of applying technology in the classroom and got them adequately empowered with digital skills. Also, she was project coordinator and technical lead for the MTN Foundation SchoolsConnect Initiative, which set up modern computer learning centers in over 28 Nigerian schools and equipped teachers with the Teaching with Technology Methodology. In addition to Ekene’s professional experience, she holds a Bachelor’s degree in Computer Science from the National Open University of Nigeria. Ekene enjoys volunteering; she has served as a mentor and facilitator at Afro-Tech Girls, a nonprofit in Nigeria promoting STEM education in secondary school-aged African girls and with Project Revamp Africa, an educational and leadership development initiative building young leaders in public secondary schools. 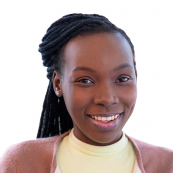 Ekene is passionate about education, technology, career guidance, and solving the STEM skills gap for the girl-child.